A little cowboy in a wheelchair watches last year’s Red Bluff Round-Up. As part of the Wings of Angels group, he has a life-threatening illness. The Round-Up helps raise funds for Wings of Angels, a charity group that raises funds for families with children with serious illnesses. Photo courtesy Donna Araiza. Red Bluff, Calif. – The Red Bluff Round-Up is a fun place to be, the third weekend in April. But it’s also a giving place. The Round-Up’s board of directors, its general manager, and its hundreds of volunteers believe in giving back. Last year, the ninety-seventh year for the Round-Up, over $150,000 was donated to groups, youth, and a variety of associations throughout the North State. One of those groups benefitting from the Round-Up is Wings of Angels. Officially called the Alyssa Araiza Wings of Angels organization (named after its founders Dan and Donna Araiza’s daughter, Alyssa, who passed away as a child), the group comes alongside families with children suffering with pediatric cancer or life-threatening illness. It gives funds to families, to help with groceries, fuel, utility and phone bills, and more. 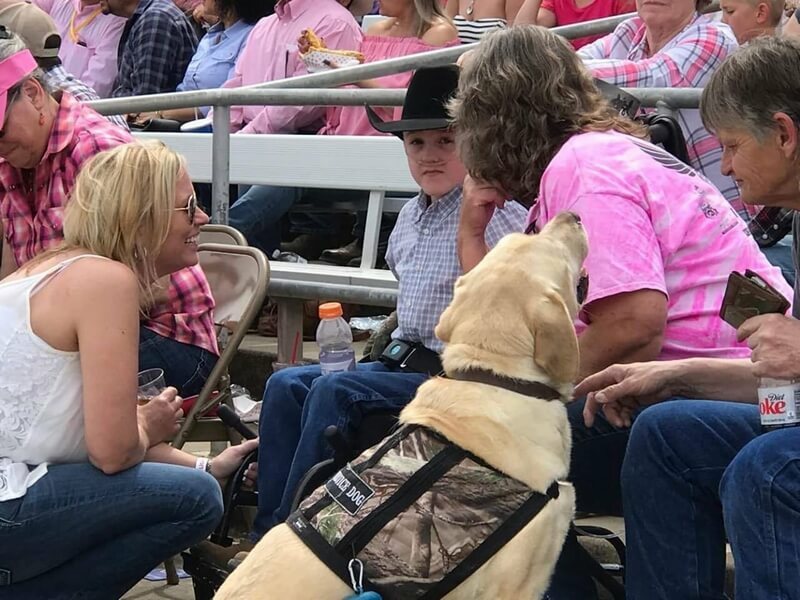 For the past two years, children with illnesses, and their families, are guests of the Red Bluff Round-Up, and the Round-Up has helped raise funds for Wings of Angels. 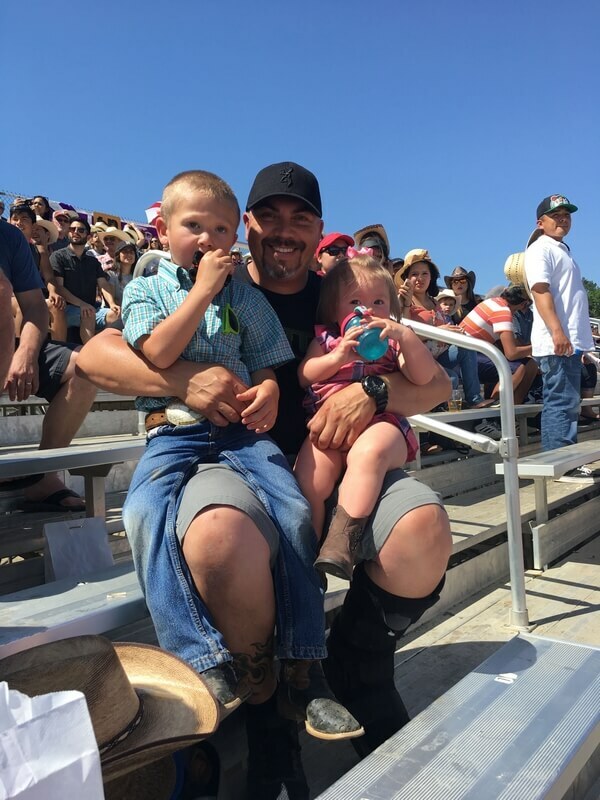 A father poses with his children at the 2018 Red Bluff Round-Up. As part of the Wings of Angels group, the family attended the Round-Up. The son now dresses like a cowboy and has made friends with rodeo people. Photo courtesy Donna Araiza. This year, funds raised from the Round-Up’s annual volunteer appreciation night will go towards sending a Wings of Angel youth to Las Vegas in December as part of the Golden Circle of Champions. Participating youth in the Golden Circle, all with life-threatening illnesses, are treated to a performance of the National Finals Rodeo, a variety of gifts, and are matched up with a pro rodeo cowboy or cowgirl. Another group that benefits from the Round-Up is the college athletes at Simpson University. This will be the third year that athletes from a variety of teams at Simpson, in Redding, Calif., will work as ticket scanners, ushers and in the parking area for the Round-Up. In return for their volunteering, the Round-Up makes a donation to Simpson’s athletic department. Last year, the Round-Up donated to a variety of groups, organizations and causes, from the Camp Fire victims to Paradise High School Athletic Dept., from the California Junior High School Finals Rodeo to the Tehama District Fair. This year’s Round-Up will be held April 17-19 at the Tehama District Fairgrounds in Red Bluff. Performances begin at 7 pm on April 17; at 2:30 pm on April 18 and at 1:30 pm on April 19. Tickets range in price from $14 to $35 and can be purchased online at www.RedBluffRoundup.com or at the Round-Up office (530.527.1000). For more information, visit the website or call the office at 530.527.1000.